Bill Blair, federal minister of border security and organized crime reduction, attends a news conference in Toronto on Aug. 3, 2018. Canada is willing to consider any possible measures that might reduce gun violence and organized crime, but will stay the course when it comes to border security, says the federal minister who’s now overseeing the Liberal government’s approach to all three. 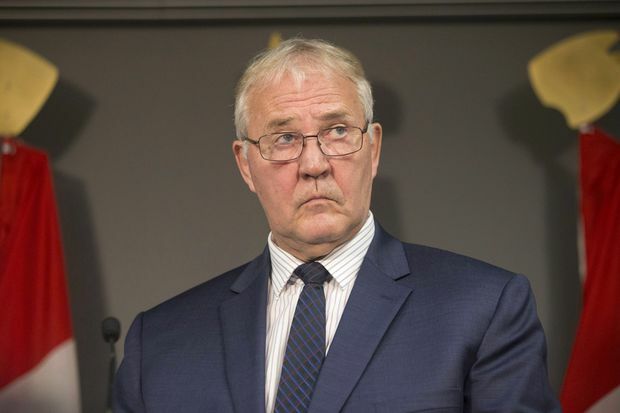 Bill Blair is acknowledging that the latest rash of shootings – most recently in Toronto – has touched off a sense of urgency among the public for the government to do more to keep deadly firearms out of the wrong hands. Prime Minister Justin Trudeau has now tasked Blair with conducting a “deep analysis” across government to examine what additional steps could be taken to tackle the scourge of gun violence – a subject with which the veteran of the Toronto police is intimately familiar. The government’s work will include looking at “any measure which will be effective,” he added. Last month, two people were killed and 13 others were injured after a gunman, who also died, opened fire on one of Toronto’s busiest streets – just the latest in a number of deadly shootings this year. In response, Toronto city council passed a motion urging the federal government allow the city to forbid the sale of handguns in the city and for the province to outlaw the sale of handgun ammunition within city limits. Ontario Premier Doug Ford announced $25-million in new funding Thursday to combat gun violence in Toronto, but said he would not support a proposed ban on handgun sales. The federal government has already said it would consider a number of different ways to crack down further on handguns, including empowering municipalities to do so – a commitment Blair reiterated this week. “We are quite prepared to look at how – in certain parts of the country perhaps – greater restrictions might be implemented. But in addition to that, you have to recognize that in and of itself is not the sole solution,” Blair said. Meanwhile, other aspects of the former cop’s newly minted and wide-ranging cabinet post are raising concerns. Advocacy groups that work with refugees sent a letter to Trudeau calling a cabinet portfolio that includes both border security and organized crime a “toxic combination” that conflates the two issues and could fan fears and xenophobia against refugees seeking asylum in Canada. Blair’s portfolio “inescapably risks feeding the very dangerous narrative that people who are fleeing for their lives are breaking the law and even threatening our security,” reads the letter, signed by officials from Amnesty International, the International Civil Liberties Monitoring Group and the Canadian Council for Refugees, among others. “We have to make sure that, however people come into the country, there is no risk of criminality or national security... but it’s within a broader portfolio,” he said.